Derbyshire Roads Policing Unit has posted images of the cars affected by a five vehicle collision at the A38/M1 slip road. Highways England had previously announced there would be delays on the M1 northbound after a collision on the slip road at junction 28. It is expected that there will be delays back a number of junctions while the vehicles are cleared. 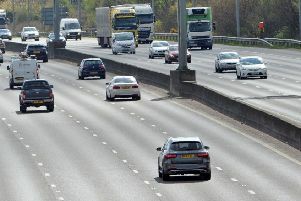 A spokesman for the unit said: “M1 J28 Northbound exit slip. 5 vehicle collision at the traffic lights. No injuries. Normal traffic conditions are expected to return by about 1pm.